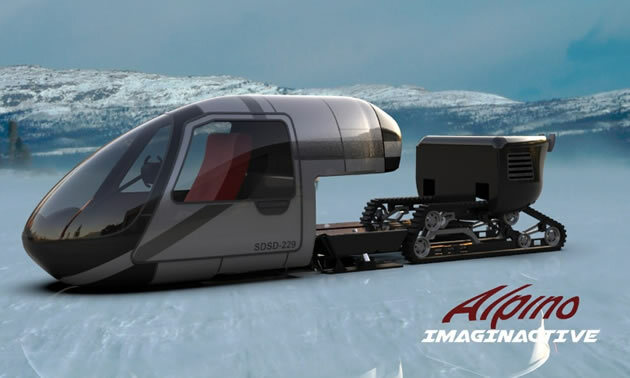 The Alpino is a concept for a recreational ice fishing snowmobile. It would be designed to ride to your favourite fishing spot and protect you from the elements. With its twin track and hybrid engine, the Alpino would be strong enough to pull additional pods and create a small fishing village. This idea was brought to me by Eli Perrett from Valentine, Nebraska. Perrett grew up fishing on local lakes in Nebraska, the Dakotas and Wyoming. He’s interested in the development of a tracked vehicle designed and engineered for winter fishing. He proposed interesting features, and Jorge Ciprian helped turn his vision into an exciting concept. 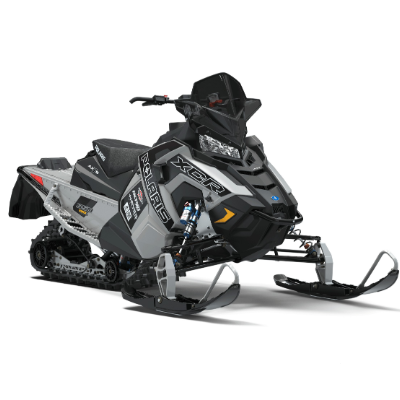 The Alpino would be driven by two tracks and steerable skis in front similar to the Ski-Doo Elite snowmobile. It would have an insulated and heated enclosed cabin inspired by the Bell 505 Jet Ranger X Helicopter. 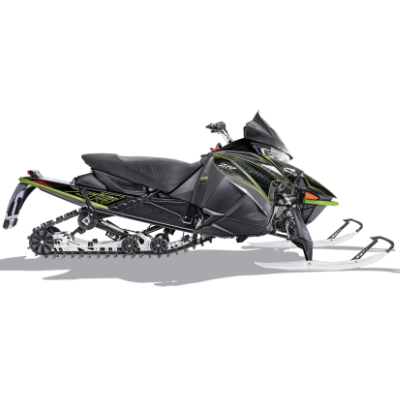 This snowmobile would have a top speed of 80 kph (50 mph). Its cabin could be made of a light composite material and it would weight around 450 kilograms (1,000 pounds), depending on the size and type of engine used. A propane heater and heat exchanger would help the pilot/fisherperson stay warm inside while driving to their favourite fishing spots. The Alpino's cabin would feature a rubber-sprocket mechanism that would allow the cab to sit down flat on the ice when the vehicle is in “fishing mode.” The driver’s seat would slide backwards to reveal a small hatch door in the floor to drill a hole through the ice and then fish. The Alpino would be available in a single-seat and side-by-side configuration. It would come equipped with a hitch to pull other Alpino pods (or a trailer mounted on skis). Each pod would be no longer than two-and-a-half metres (eight feet) and weigh less than 180 kilograms (400 pounds) so you would be able to park them side-by-side and fit multiple units on a flatbed trailer. The Alpino would target the market of every ice fisher in the U.S., Canada, Russia and northern European countries like Finland. It would be easy to transport these snowmobiles with a pick-up truck. Ski resorts and hotels could also rent them out to their guests. Furthermore, the Alpino platform could also be developed as a sightseeing model, designed to carry four or more people. 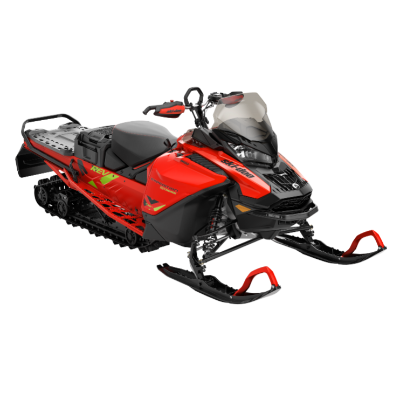 And other models equipped with ATV wheels and tracks could address the market of hunters and cross-country explorers. The Alpino concept was designed by Jorge Ciprian, an industrial designer from Argentina. Ciprian graduated with a degree in design from the University of Buenos Aires, and he currently works as freelance designer. He also designed the Manitoo eco-friendly ATV and the Vector hydrofoil. Charles Bombardier is the grandson of Joseph-Armand Bombardier, founder of Bombardier Inc. In 2013, Charles founded Imaginactive, a non-profit organization whose mission is to inspire future generations to dream and build the vehicles of tomorrow. The company has produced over 300 futuristic concepts by collaborating with industrial designers from around the world.